We offer lollipops, cotton candy, and more after every visit! Digital eye exams, high fashion eyewear, eye candy, and edible candy! All of your favorite things. We want to make your experience at the optometrist as sweet as possible so with every purchase of glasses, we give you free candy(and not just a sample size either)! We will do our best to accommodate your busy schedule. Request an appointment today! Please complete this form to request an appointment. Please note that you do not have an appointment until you receive confirmation from us. Thank you! Miami Lakes resident, MPHS, ICS, and NSU Alumna, and Infinite Vision Eye Care Owner Dr. Giannie Castellanos has put so much love into creating this new local optical for the kids at heart and wants to assure everyone enjoys their occular health experience. Everyone needs regular eye exams. It’s important for adults to schedule eye exams to monitor their eye health and check for problems. Glasses, more than ever, say a lot about your personality, style, and fashion. Selecting the right frames can be confusing and daunting, especially for first time patients. Keratoconus is a non-inflammatory disorder that affects the cornea. Keratoconus can affect a person’s ability to read or drive, which can be a major obstacle for people. 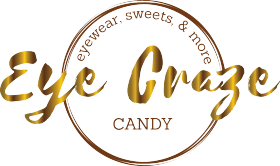 At Eye Candy – Eye Wear, Sweets, and More, our sweet staff works together to ensure your visit is comfortable and completed in a timely manner. We have a qualified team of professionals that will work around your busy schedule and address any questions or concerns prior to the appointment. Whether it’s a general eye exam, finding the right pair of designer frames or treating a condition that requires an in depth diagnosis, our team provides undivided attention to each patient so we can evaluate a plan based on your needs and our professional opinion. Dr. Castellanos offers full vision examinations and will diagnose and treat an array of eye diseases and conditions to keep your eyes healthy! The fact that this place combine delicious chocolates and excellent eye care is beyond original. Plus, charming professional staff performaning rigorous eyes examinations. They also offer very good prices for designer brands. Can’t wait to come back :) Highly recommended. Dr. Castellanos is the best! My daughter had something in her eye and she saw her right away as an emergency. This type of service is unheard of nowadays. She is great with both kids and adults. She is very detailed with her eye exams. Another perk is that the location is gorgeous. I would recommend her and BOTH her locations without hesitation. Dr. Castellanos is amazing ! She is knowledgeable, skilled, and compassionate. She’s empathic, humble and always looks to serve her patients to the best of her abilities. I’ve been a patient of Dr. Castellanos for several years and I have had the privilege of being seen at both of her locations. Both teams of staff are super friendly, willing to help, and caring. Overall, Dr. Castellanos and the staff are the best ! I came here for an eye exam recently and bought glasses and sunglasses. I’m so glad I came to Eyecandy. The doctor is detailed, caring and so knowledgeable and the equipment is state of the art. There were so many options for eyeglasses that I almost couldn’t decide. And at the end I took home some chocolate covered oreos which were amazing. Thank you Dr. Castellanos & team. I will be back for sure! The theme of this office is Fun and inviting goes very well with Dr. Castellanos! She is very Friendly and makes you feel as if she has known you forever. I would definitely recommend her and her staff. Great selection of frames and sunglasses. Excellent treatment of kids for exams and sweet treats to wrap up your visit or worth a trip on its own. Dr. Catellanos and her staff are amazing. Sweetest doctor ever, her practice’s theme matches her personality :) They really care about their patients and reward loyalty. They work with your budget and are great at suggesting many options until you are happy and satisfied. Chocolate is almost as good for your vision as carrots are, and let’s be honest, which would YOU rather eat?